I enjoyed this story. I can’t say I loved it, and part of that reason may be because I listened to it on CD with my boys over a two-week period instead of reading it alone in a couple of days. But it also left me feeling a little gypped. Titles from today’s commercial fiction provide a fast ride, gadgets and hip dialogue which, I suppose, today’s kids eat up, but they feel so shallow, always missing the depth and beauty I so love. For that, I have to search out more traditional stories. But The Maze of Bones is fun. Written in typical Riordan style, it has easy-flowing prose, some funny moments, and lots of adventure. Within, Dan and Amy Cahill, two young orphans, become embroiled in a contest initiated by their dead but very rich grandmother. It is a search for treasure, a competition between family members, and a dangerous ride. For the Cahill family is the most powerful family in all of history, and each competing team will stop at nothing to win the treasure for themselves. The first clue begins with Benjamin Franklin, himself a member of the Lucian branch of Cahills. Dan and Amy, accompanied by their au pair (babysitter), Nellie, follow leads to Philadelphia and then to the Parisian catacombs, surviving adventure after adventure. Their hunt turns up an ingredient and a second clue, which promises to lead them to Venice. I happen to know the outcome of all the ingredients, which also probably contributed to my less-than-optimal enjoyment of this book, because I accidentally picked up the first Cahills vs. Vespers (a spinoff series) book. I knew in moments I had the wrong story, but I read it anyway. More on that next time. 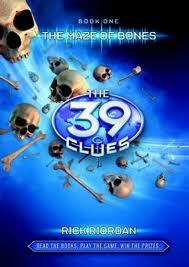 My final thoughts: Kids are going to love The 39 Clues. Judging by its bestseller status, they DO love them. But me? I get a little turned off by all the marketing paraphernalia that has gone with them. The story itself, however, was entertaining and clean, and I’d recommend it to kids and parents. I just might wander into the next book myself, but I haven’t been driven there. I read the first book when it came out, but I’ve had no desire to read the rest, so I hear you! Hi Joanne. I guess we just didn’t click with this one. But I am a little curious to see the individual styles the authors bring to the series, and I’d gladly make these available for my kids. Lol. You’re right. In the end, it’s reading. Great idea on comparing styles! I’ve snubbed this series for quite a while without any specific reason. Now I feel less inclined to read them. Unless I can get my hands on all of them at once maybe? Hi Akoss! This one wasn’t bad, but it wasn’t great. I guess I just reach a limit with commercial and start longing for a little more depth. The kids sure love it.